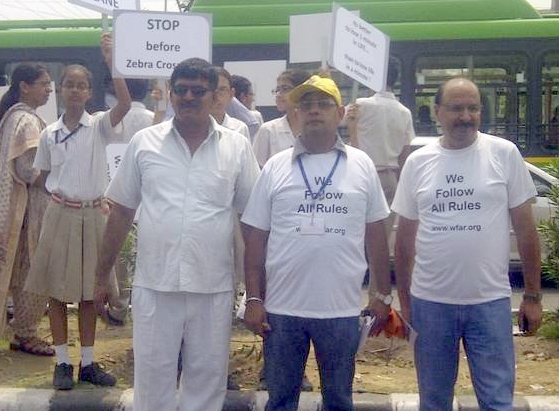 We Follow All Rules (WFAR), a grass-roots, people-led initiative recently organised a Road Safety Awareness March & Campaign in association with Delhi Traffic Police. Students of Maxfort School Dwarka also participated in the event. The event began with an awareness raising exercise which included distribution of leaflets containing important Traffic Rules to various road-users. School children and members of WFAR stood at the junction of Sector-1, 2, 6, 7 holding placards with messages on road safety. This was followed by an Awareness March to junction of sector 6, 7 on Road 224 in Dwarka. During the event, Special Traffic Wardens of Delhi Traffic Police booked 40 offenders in less than 1 hour for violating traffic norms, like driving without helmet, without seat-belts, violating zebra crossing, defective number plates etc. This event acquires significance as India holds the dubious distinction of recording maximum number of deaths in road accidents. WFAR believes these accidents can be reduced if people become self disciplined and obey traffic rules voluntarily rather than wait for traffic cops to enforce them. In its endeavour to create greater abidance for traffic rules, WFAR is planning to organise more campaigns in Dwarka and elsewhere. THE IMPORTANCE OF RATIONALITY IN OUR LIVES & HOW IT HELPS US LEAD BETTER LIVES. DWARKA FOOD COURT is known for delicious food.